At the southwest corner of Trafalgar Square is a road that passes through the Admiralty Arch. This building acts as the gateway to the Mall, the processional boulevard leading up to Buckingham Palace. As a result, you often see photos of carriages and limousines passing through Admiralty Arch on state occasions. 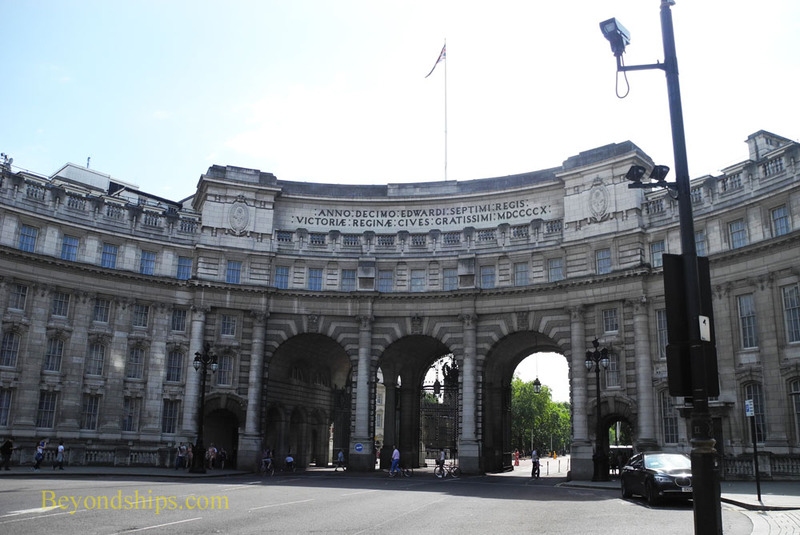 Admiralty Arch has five archways. The two smaller ones are for pedestrians while the larger arches next to them are for automobile traffic. In the middle is a a large arch that is reserved for state processions. Completed in 1911, Admiralty Arch was commissioned by King Edward VII in memory of his mother Queen Victoria. It was designed by Sir Aston Webb who also worked on several other London landmarks. 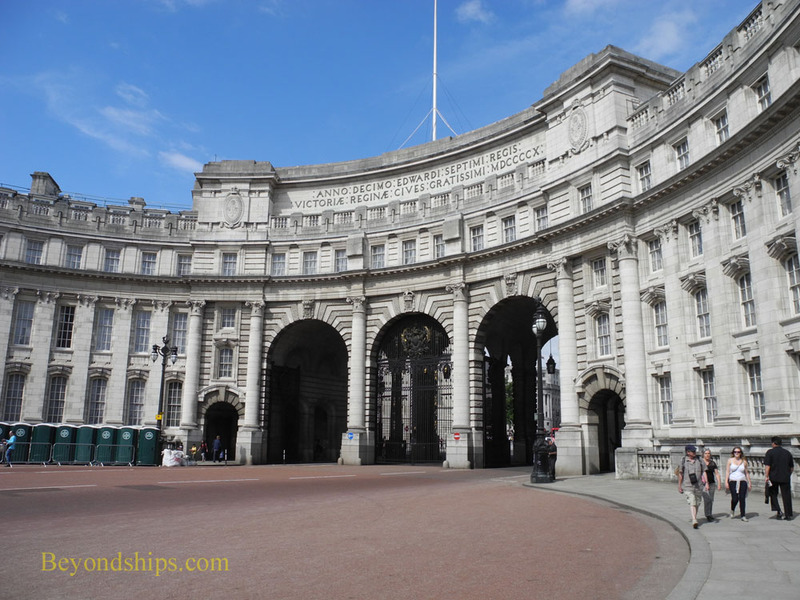 Admiralty Arch adjoins the Old Admiralty Building and originally housed the Sea Lords who command the Royal Navy. However, it has been used by a number of government ministries over the years. Prime Minister John Major stayed here after a 1991 terrorist attack damaged No. 10 Downing Street. In 2012, the government signed a 125-year lease placing the building in private hands. Plans call for it to become a luxury hotel. Walking towards Big Ben along the right hand side of Whitehall, you eventually come upon mounted soldiers wearing highly-polished helmets and breastplates. These are not actors but rather troopers from the most senior regiments in the British Army. Together the Life Guards (red tunics and white plumes) and the Blues and Royals (blue tunics and red plumes) make up the Household Cavalry. The building that these soldiers are guarding is called Horse Guards and is the headquarters of the Household Division, which includes the two cavalry regiments as well as the five regiments of foot guards. In addition to their ceremonial duties, these soldiers serve in combat zones including Iraq and Afghanistan. 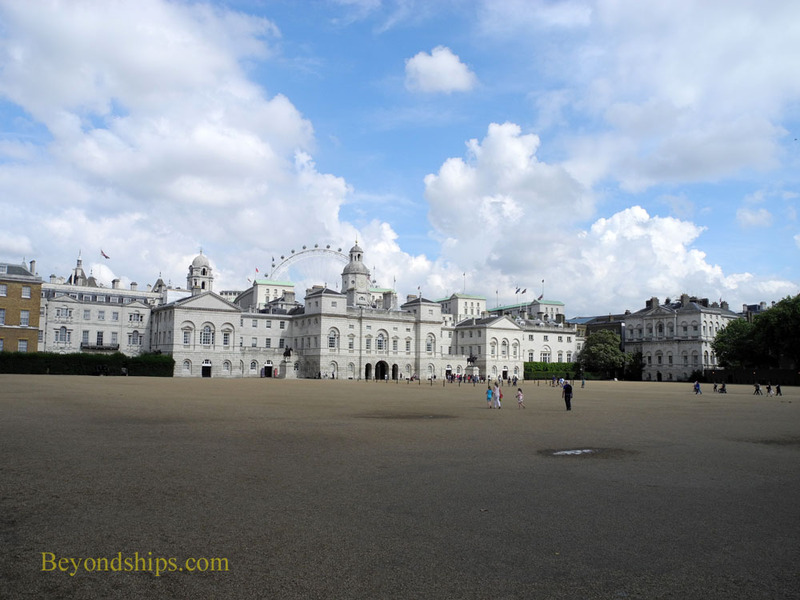 You can walk into the courtyard of Horse Guards. Here, most afternoons, visitors can watch the guard being inspected. Going through the archways at the western end of the courtyard, you come to a vast parade ground known as Horse Guards Parade. Most mornings, there is a mounted changing of the guard ceremony here. (See separate article). The parade ground is also used for the annual Trooping of the Colour in which all of the Household regiments assemble in the presence of the Queen and members of the Royal Family. From time to time, civilian events are also held here. 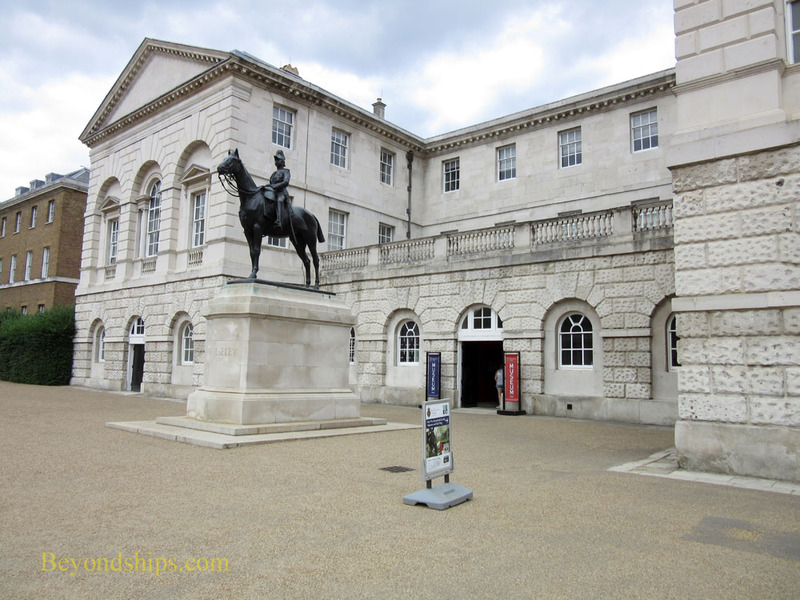 To the right of the archway is the entrance to the Household Cavalry Museum, which tells the story of the Horse Guards and provides a look into their work including a live view of the troopers working with their horses in the 18th century stables, which are still in use today. For information about visiting, see the Household Cavalry Museum website. Returning back through the archways and out onto Whitehall, there is an important building on the opposite side of the street. 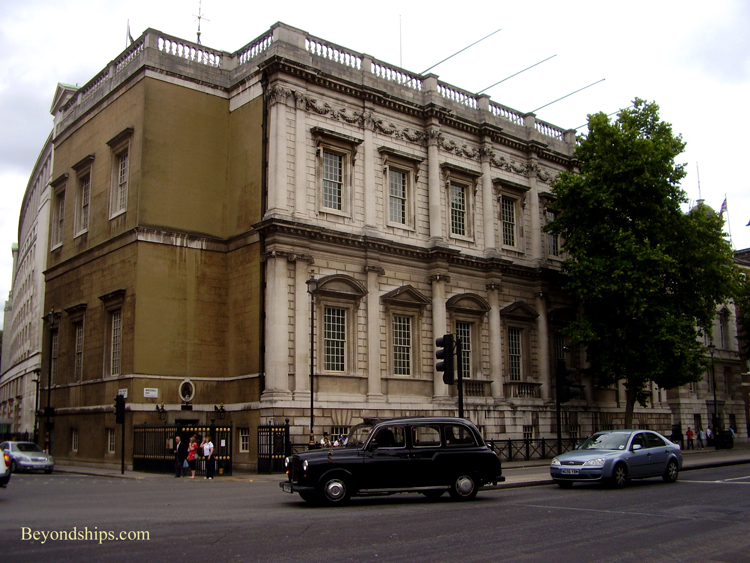 This is Inigo Jones' Banqueting House, the only remaining part of Whitehall Palace. While the name Banqueting House suggests frivolity, a very serious drama unfolded here. It had to do with the struggle for democracy and involved the execution of a king. Beyond its historical importance, the Banqueting House is important architecturally and as the home of a masterpiece of fine art. (See our special feature on the Banqueting House).